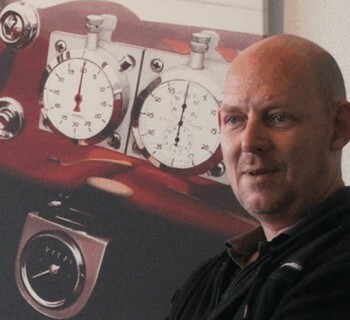 AFAS Austrian Automotive Artist Klaus Wagger gets the expression of speed in his paintings and explains why it is so important to ' keep the flow'. Could you please tell me more about yourself Klaus? I read in your biography that you started out as an industrial design engineer. Well when I found out I wasn't really suited to an office, I started working freelance and actually got into technical illustration. It's not the idea of the car, it's the movement, noise, being dynamic. Technical? For which kind of products? All kinds, central heating, cars, motorbike engines, binoculars whatever came along. Was it illustration work for marketing, technical details or the design and appearance of the product? No cutaway drawings. I was very much into that. Did you pick that education because you were young or was it your ambition? I wanted to study industrial design but the way the job was presented back then, wasn't exactly what I was looking for. With freelancing you look for opportunities. I always enjoyed drawing and painting and there was some technical interest as well. Don't ask me how, it wasn't a master plan but I somehow got into technical illustration. And you started in a period when the computer was not used yet? No, it was big perspective prints, line drawing and airbrushing etc. Actually when the computer started to play a big part, I put it out because the bottom of the market fell out. Everybody was constructing in 3D and all you had to do was convert the files into graphic files and put them on a pile. Except for a very few people who were still doing a lot of manual work and the big jobs which were for presentation work. I think there is no real fun in the business anymore. So you did not make the step to computer technology but remained doing it the traditional way? I was doing it on the computer but I didn't follow the 3D move really. I did some construction work on 3D but then used the line drawings in photo shop because I prefer to have control over the surfaces. You can give a computer certain information but then the machine does what it wants and I prefer to control the whole process. So I was working in 2D in the same way I was working with an airbrush in photo shop on layers, which was quite an advantage. I read in your designing career that you already did work for the automotive industry. Is that correct? Yes I was working for GM and Volkswagen. 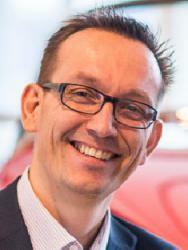 I got in touch with the automotive industry because there was always a strong interest in cars to some extent. Not in the way that I am in love with cars but with the technical idea of the car and the emotional side of techniques. It's hard to explain. When I look at your artwork, you seem to have a preference for the real classic cars where you see all the mechanics on the front, suspension etc. Is that because it shows the technique you just mentioned. It shows more of the movement. The way cars move. The more I do it, the further back I move to show the driver as well. Emotion is an aspect to play with for me. When I can see movement with a modern Formula 1, it doesn't make a difference if it goes around a corner or on a long straight. It almost stands still and looks the same. You can't really do very much. On and off I try my hand with modern F1 cars but I find that to really get some fun into it, I have to distort them and do all kinds of things with them. With older cars, there is a lot more to play with, in the 'motion' sense and that's the important thing for me. In your Jaguar D type painting, you can see that it's doing the corner and the suspension on one hand is really suppressed, while on the other, the car is almost lifted. Is that the kind of dynamics you want to show? Yes, showing the movement in a painting. You get one shot to pack the movement into it. So what helps is to get them at the right time in the corner at a certain point when things look right and you see the motion. Other places it might look awkward, so I am trying to catch that moment where you get the expression of speed in the painting. It's very important for me. If you want to capture that specific moment in the corner, do you work from photo's or is it your observation during a race? No, it's a mix of all kinds of things. I read a lot about old races. I am in the happy situation that I meet people who have been there and get to talk to them and they tell me things about certain races. Then I see a lot of cars being around the shows and races. So some shapes, and this is where the designing comes in, get my interest. Out of all of this, I try to get my ideas for paintings. Sometimes it's easy, it's just a feeling. But other times I get stuck on a certain car and have to try again and again to work out which angles will work and which will not work at all. I try to find reference material but of course the whole car has to look correct. That's very important. I usually look for modern photo's because they show up the detail and I look for old photo's to see how they really looked at a certain race. Cars have been changing along the way. Then I try to get photographs of drivers, of the atmosphere, the cars. I take photo's myself. I try to get a whole pile of information. So a lot of study goes into the preparation beforehand. Oh yes, it's just ongoing. I put everything on my computer which gets my interest. Then I keep going through it again and again. Maybe I get an idea from it or not. Sometimes you have to find out if an idea is strong enough to support a painting. What looks good at one moment, might be too weak and might not support the whole painting and end up being boring. Does that mean that you visualize the end result in your head or do you make sketches? I have an idea in my head. I usually don't like to do sketches too much. I do a very precise line drawing which is a technical drawing really and then try to take it apart again when I paint it. It's like a dialogue in the painting, looking to see if I need things or not need them. It's hard to explain. This is why I am an artist and not a writer. You are not a writer but in a way you are telling stories with your paintings. Yes I like to tell stories and what I find important in my paintings is to keep things floating. Not plant them on the ground just showing a car but to keep them alive and moving through the whole process of creating the painting. This can be nerve racking sometimes and very easy and enjoyable other times. You never know what is ahead. And they are indeed always moving. So you wouldn't paint the car which is on the parking lot. Hardly ever. It's not the idea of the car. That's an interesting statement. It's not the idea of the car. What is it then? Movement, noise, being dynamic. For me it's not even so much about cars. I choose cars because everybody who sees a painting has an opinion about cars; good or bad. Everybody has a connection to cars and so it's one of the most emotional technical pieces you can have, or paint about. A lot more than planes or ships or whatever. So I am generally drawn to fast moving lumps of iron that are very noisy. That's what interests and fascinates me and it happens to be cars. In that way you are more a general artist who happens to paint cars. Do you see it that way? I am interested in cars but it comes more from the designs and the shapes. That's why I prefer the closed body sports cars, the F1 cars in general. I like the shape. Then on the other hand, I like the emotional side of technical things. Cars just come in handy. I am not the guy who owns a classic car or goes out driving to experience things. When I want to experience speed, I go to more direct methods like skiing and throw myself down the hill. That's a lot of speed with minimal things around me, which is very straight on and direct. This is the same idea I am trying to transform into my paintings. Just being straight on. It should get right at you and grab you and hopefully that works most of the time. By selecting the cars as the topic, you are kind of forced into the automotive art scene. Is that limiting the exposure that you are getting? Very much actually. Because automotive art is kind of a side line. It's not real art. It's illustrations, whatever you want to call it. I don't mind. But on the other hand, we are usually not selling to galleries very much. We are selling at races, at classic car fairs, wherever. So it puts us into a very niche market. 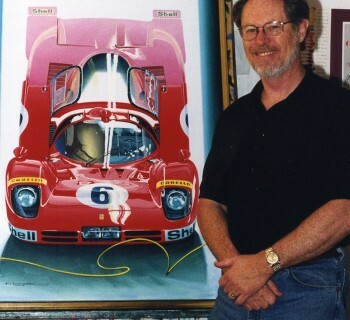 Why do you think that the regular art world doesn't appreciate automotive art that much? It's a very wide field. Whatever regular art is, you can go from abstract to landscapes to portraits. Some fields are established and you get galleries for portraits or for landscapes or for still life etc. My experience with galleries is that they were not interested. By the time things started to work out and sell, I got offers to show but galleries still don't understand the problem they have. They are getting customers who know a lot more about the subjects than they do, and they want to have technical explanations which the galleries can't give. They don't have to do this with a portrait or with a landscape. So that makes it hard for the galleries as well to understand the subject. There are not many who can do that. And have you come across comments from owners of a particular car whose mirror is a different design or has other wheel rims etc? Yes and I am very precise about these kind of things because I don't want to get into trouble. But you still get told that certain Porsches don't have orange indicators, they have clear indicators. Sometimes I'd rather go for the shape than absolute historical correctness. Nowadays, have you become a full time artists, or are you still doing your industrial design work? No I am painting full time. You already mentioned a little bit about the process. It takes a long time before you have the picture in your head. What is the trigger? Where does it start? Very different. When you are dealing with subjects like I do, you are constantly alert. So whatever comes along, and it could be just scenery or the light. I've done paintings of scenery and the light and have then decided which car I would put in there. It can start at every end. Something just hits me, I see things and think okay that would make a good painting. I am always looking. Do you keep a journal for yourself to capture those moments or is it in the back of your head. No, when I have an idea, I look for some reference material and then collect it in my folder and then just leave it and keep coming back to it. Then I start getting material and start working off that. I noticed that you always use the larger canvases to paint on. Yes, I like the work to be physical. I like to get into it. It's not just the hand, it's the full arm, the shoulder, everything involved. I just love to work big. So then it becomes physical exercise creating the painting. I'm not looking for this in particular. I'm just trying to get involved with the whole painting and that's part of it obviously. I never thought about it but I don't want to go smaller than a certain size. It just doesn't suit me. Do you work on one piece at a time or several? When I get to the stage to start painting, I always do one at a time. I have to stick with it because I don't plan things too much. I have a precise line drawing and don't very often do a colour sketch. Mostly I've just got things in my head and then work towards it and that means that once I start with it, I have to stick with it so as not to lose it. Otherwise if I would go away and come back to a painting after a few days, I would have to reinvent everything. So I try to stay with the painting and finish it in one go. Your techniques; you start with a precise line drawing of the car. What are the next steps? Well what I do is, I don't transfer the line drawing on the canvas completely, just the bits I need. I try to transfer what I need at the time and try to work over it because I usually start with the background and atmosphere to set the tone and then start working towards the front. You use a lot of bright colours for the background. I am not a very subtle person obviously. It's noisy and loud. I guess that's okay. I got the feeling from your biography that the moment you subscribed to the Mille Miglia 2000 contest, it was a kind of breakthrough for you. Is that correct? It wasn't the biggest breakthrough but it sounds good in the biography. Overall it wasn't such a big step but it showed me I could get somewhere doing it and it adds prestige to the whole thing. But the real step actually was becoming part of the Retromobile in France and starting to exhibit in Paris That was the most defining moment for me. 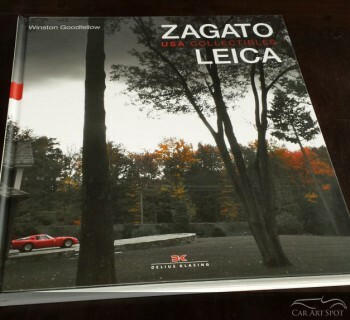 A lot of other automotive artists are reading my blogs. What kind of advice would you give to an amateur or somebody who wants to become a full time artist? Don't try it. Don't do it. I didn't have a master plan. Things happened to me. Opportunities show themselves to you when you need them and not when you start looking for them. It's hard to tell because there isn't one recipe. You know a lot of different automotive artists and everyone has a different approach. That's the fun thing about it. So there are so many different ideas. There isn't just one way and the most important thing is to not imitate. Get a recognizable style. That's the hard part. You mention an important part is to get your own recognizable style, which you definitely have. How did you develop that style? Again, I don't really know. I just felt a need. I didn't start painting with the idea of marketing it. It was a side kick to my technical drawing work. Actually I never stopped drawing and painting since getting out of school. I just kept doing it without a commercial after thought. I was doing it for myself and the paintings were piling up. Then I ran into people who showed me that there was a market and an opportunity to sell and that was Paris. So I had been doing this for a long time before I even got onto the market. I had a sort of finished style already and this style was fairly unique at the time. Moving cars and pretty wild colours hadn't been there before and so it was actually making waves by the time I showed it. So for you it's important to show the movement and the emotional aspects. Did I understand you correctly that you are going even more into the direction of showing the emotions of the driver? Well actually in earlier cars, if you go back in time, you get the driver sitting more on top of the car than being part of it or into it. As I want a more emotional aspect to the whole thing, the driver is getting more and more important in my paintings over time. I spend more time on faces and positions because this too shows a movement, an action and they are the opportunities I am looking for in the painting. Getting things moving, not slowing things down, not stopping them but keeping them in the flow. Describing a car to me means being precise and balancing things in a painting, which is the hard part. How to balance it to make it move but still be recognizable. Where do you find your inspiration? You are a member of AFAS. Do you get inspiration from meeting with your automotive artist colleagues or also elsewhere? Actually not so much. It's usually from just walking around going to events and reading about things. As I am painting usually vintage cars, I have to know about the history of the cars. So I look at books, read things and try to understand the times back then and the atmosphere. My idea's come from pretty much everywhere but more from what I see and read in books or from chats I have with people who have been around them. Do you speak with the old drivers who used to drive the cars when they were modern? Yes for example, I had a nice chat in London with a very well known driver. I am always meeting guys or bumping into them and they tell me or correct me on things. I can ask them how things were in a certain particular way, a description of a situation which you can't get in a book or in photographs or anywhere else. Do they also come with stories which you would like to paint? Well it happens on and off but it's quite often people who are more in my circles, like photographers. They are quite good to talk to because they have been around. They have a certain eye and can remember situations and describe them really well. That's very helpful. Is there an artwork or dream on your bucket list which you want to create in the future? No, I've got a list of paintings I want to do but nothing which particularly sticks out. Things just come along. At the moment I am at the point where I think I have done some pretty amazing stuff and had the opportunity to do. Nice things like Mille Miglia, which was an experience being around all those guys. Designing the posters for Daytona 500 . 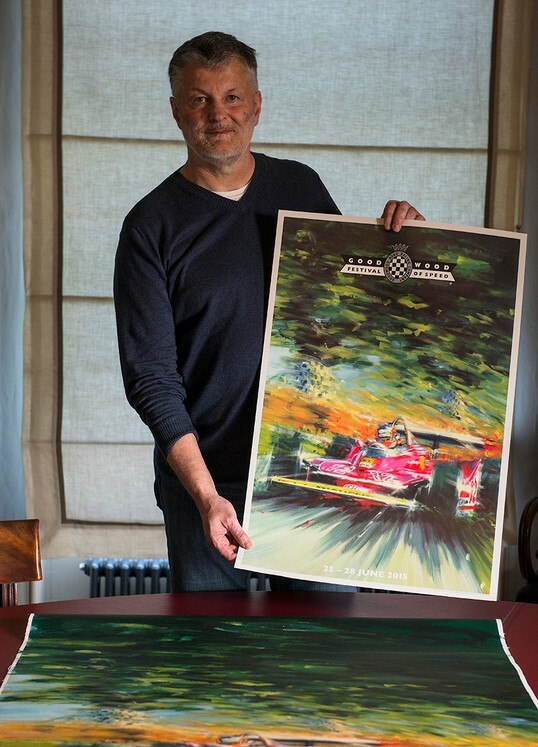 Then just recently I have taken over from Peter Hearsey and am doing the speed posters for Goodwood Festival of Speed. So your life brought you unique opportunities and you are enjoying it. To see a lot more paintings from Klaus Wagger, please visit his website.